Raghu Patil a resident of shirdi village would start any work , only after visiting Baba and saluting him. Once he went to Nevasa village to see his brother in law. He went by horse to srirampur and from there by tonga to Nevasa. He woke up the next morning and remembered Baba, praying to him with closed eyes. He heard the following words in Baba's voice," If i give darshan do not be frightened." In the meanwhile a servant working in the cowshed cried," snake! snake ! ". Alla ran there. Raghu patil thought that Sai had come in that form and put a bowl containing milk infron of the snake and it drank the milk. The frightened people ran away. While Raghu patil was watching , the snake crawled for some distance and desappeared.He felt very happy that sai had given him darshan in the form of snake. Baba always took two rupees as dakshina from purandhare. Curious about this he asked Baba why the denomination." I do not care for the monetary value of the money" , replied Baba ." But I want to stress Shraddha and saburi, So I asked of only of ten times Baba gave purandhare money that he carefully preserved in his place of worship and so did his son. But what about the future generation? They may or may not know its value, So his grandson took all the coins to a goldsmith and got a silver statue of Baba made. He figured that the idol would be taken care off. The silver idol is worshipped daily. In the year 1876 Samardha Akalkot Mahhaj attained Samadhi in the Village of Akkalkot. A devotee of his was preapring to go to Akalkot in 1904. 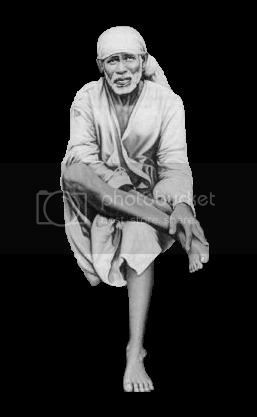 But akalkot Maharaj appeared in his dream and told him that there was no need t0 c0me to Akkalkot as he was at Shirdi in the Avatar of Shirdi Sai Baba. When the devotee visied Baba, the later blessed him and toled him that Akalkot Maharaj and he are the same. Sai Baba is not merely Akkalkot Maharaj. he is also the incarnation of all Gods. He appeared at Rama, Krishna. Maruti a, Datta and also as Ganesh to all devotees. Let us Pray at the feet of Sai Baba who is the incarnationn of all god and protector of all, to show mercy on us, and increase our devotion towards him. On Shivrathri day in theyer 1905 DAS GANU wanted to bath in the nearby Godavari river and sought the permission of Baba. Baba told him, why should you go to such a distant place ? Godavari water is at my feet." Das Ganu knew that Baba was the incarnation of Lord Shiva and Gangadevi would always with him. But he thought that the satisfication of bathing in a river would not be there. Knowing the thoughts inside Das Ganu, Baba asked him to hold bath the palms of his hand together and put them near his feet . When Das Ganu did this holy water flowed from the toes of Baba's feet. Wonderstruck at this Das Ganu sprinkled the water on his head with joy and got the satisfication of having bathed in the river Ganga.